By Irena S., Beardstown, Ill. When I was asked to write about the events of January 13, 1991, I enthusiastically agreed. Today, as I try to put down my thoughts on the blank screen of my computer, I understand that an easily given promise is not so easily fulfilled. 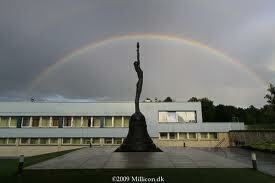 Just thinking about those tragic events in Lithuania fills me with so much emotion, even after 23 years. The words I reach for to express myself seem entirely inadequate, even artificial in the face of what happened. I remember not only my own feelings, but also the way they conflicted with the feelings of my family (especially my mom): uncertainty with faith; hesitation with determination. The Lithuanian government had resigned on January 8th, and on January 11, the Soviet Army had invaded and taken control of the Vilnius Publishing House. People were saying that the Parliament (then called the Supreme Council) building would be next—that it was only a matter of days or maybe even hours. 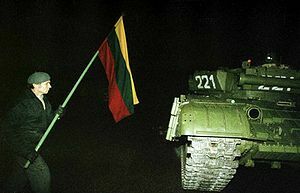 Lithuania’s independence, declared less than a year earlier, on March 11, 1990, had endured a long economic blockade by the U.S.S.R. against critical food and energy supplies. But that independence now truly hung by a thread. A lot of people were upset that the Lithuanian government had increased food prices 300 percent a couple of months earlier due to the Soviet economic blockade. Inflation was enormous and common people were under tremendous pressure. That made it a good time for our enemies to believe that the population would not resist the now-imminent Soviet military takeover aimed at putting an end to Lithuanian independence. More precisely, it seemed a good time for the pro-Soviet faction of the Lithuanian Communist Party, supported by Moscow, to try to ‘prove’ to Mikhail Gorbachev, the Soviet President, that the ideal moment had arrived to take back control of the country from the Lithuanian independence movement. How wrong they were! But my mother was not wrong to fear for my life as she pressed me not to leave her home that night. If she had known where I planned to go, it would have been even worse. As a teenager, at the very end of World War II, she had been severely injured in a grenade explosion that left her in a coma for three days. So she knew the worst can happen. But despite her fears, I was resolved to go to my old street and stand with the people there trying to defend the Radio and TV Committee building the only way they could—by forming a human barricade. It was the same in front of all our major government and media buildings, including the Parliament and the TV Tower: unarmed people with nothing but their patriotism and their unity and their hope that they would somehow be able to defend their country against Soviet tanks. Nobody knew exactly how they could prevail against tanks and guns. Perhaps that was the essence of their courage—that the answer to the question was not as important as the will and the need to prevail. 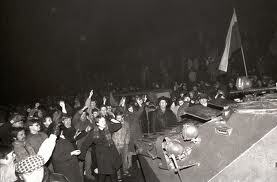 On my way to Konarskio Street, I passed a sound truck with a pre-recorded message blaring that the National Committee for Salvation, consisting of enemies of Lithuania’s independence, was now in control of the government. But that propaganda did not work—it didn’t stop people from massing around key buildings to defend them. We were praying, singing, talking, or simply standing and waiting – peacefully. I think one way we kept up our courage was by believing that Soviet soldiers would not really start shooting unarmed civilians, especially in the presence of so much foreign media. Many of us living near the Committee building ran back and forth to our apartments with food, hot water and tea or coffee to help the rest of the people in the street keep warm. I did this myself more than a dozen times that night. The threat of violence against us was so close, but as we all stood together, supporting and helping each other, there was no fear. The spirit of that night and those people, my people, is unforgettable and almost indescribable, even after all of these years. Around midnight, I was drawn away from the scene because I could not reach my mom by phone and I was afraid that something might have happened to them in another part of the city. And that is how I missed the attack on the Radio and TV Committee building that happened around 2 a.m. Jan 13. I was so angry at myself for leaving behind the brave people standing guard. 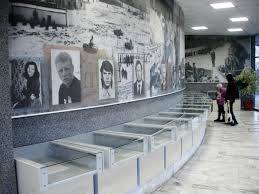 None of us slept that night as the shocking news poured in about the tanks running right over people at another location–the Vilnius TV Tower, along with the last images from the Committee building of a solider running toward the camera before it went dead. In the aftermath of all the attacks the night of January 12-13: 14 lay dead and about 700 injured, 140 of them, critically–many shot multiple times or crushed under tank treads. At my old apartment building, people had to replace all the street-facing windows shattered by tanks firing blank rounds that deafened many of the Committee building protectors permanently. But the violence against the unarmed failed. The very next morning, January 13th, 50,000 people gathered around Parliament to defend their government with their lives. 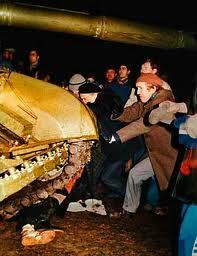 People built barricades and Soviet military trucks and tanks moved into the area, but the attack never happened. Why? Too many media from around the world covering the events, and too many people ready to die. Dedicated to all those who stood and raised their voices to save their country; especially to those who gave their lives or their health. May you live forever in a grateful nation’s memory.